HYDRATION; Need To Drink More Water? Drink it from a glass, drink it from a cup, drink it from a bowl or even from a plate! Drink it as juices, drink it as punches or even bundles of blended veggies. Drink it as simple, so very simple! Drink it as a pure colorless glass of water! Drinking enough water is vital for all living beings and things. Our bodies are approximately 65%. water! Water is vital for our existence. It forms saliva which is vital for the aid of food digestion, it assist the brain during the production of hormones and neurotransmitters, it moistens the muscle membranes, it aids in the reproduction of worn out body cells and tissues, it lubricate the joints, propels oxygen throughout the body, Water sustains the fluids of the brain and spinal cord. Is is also needed to regulate the body’s temperature. The body cannot sustain itself without an adequate supply of water. It is not clear about the definite length of time, each person will survive without drinking water. 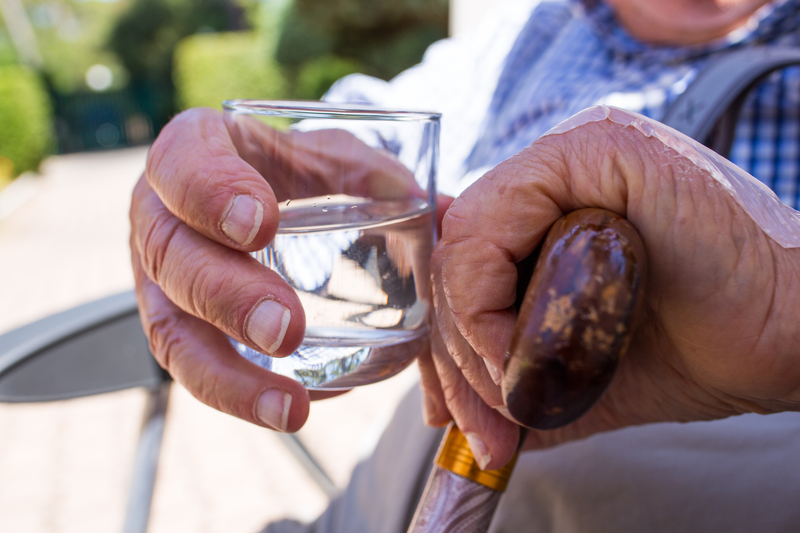 However the dangers of dehydration is almost always a concern to everyone, especially among the senior community. Staying alive without water varies, it depends on the overall physical fitness of the body, and the climatic condition. One may live a little over 14 days without water. The necessity of water to the human brain is extremely important. It functions as a barrier against shock. It serves as a transport for various waste matters and dangerous pathogens from the brain. Having enough water in the body will serve the exchange of nutrients throughout the body and brain. Hydration enhances focus, alertness and concentration. The CSF (Cerebrospinal Fluid) is about 90% of the entire brain and spinal cord. It is fluid. Fluid is water, therefore dehydration does negatively affect the brain. Symptoms of dehydration are fatigue, lower cognitive function, lower blood pressure, enhance mood changes, brain shrinkage and dry skin. When the body and brain becomes dehydrated, the brain is expected on to do the same amount of work as would the hydrated brain, as a result one may lose focus and concentration! It is easy for people who are living with Alzheimer’s to become dehydrated. They may either forget to drink water, or just don’t like drinking it at all. In all cases fresh fruits, berries, vegetables and water must be added to their daily menu. A beverage is not the same as water. Water is the drink before a sweetening agent or flavouring is added to it. Pure drinking water is usually best. Fresh fruit and vegetable punches may also be added to their diet. Make consistency a priority when planning each meal. There must never be an excuse for dehydration!